After serving his time in the army, a 20-year-old Jamel Shabazz returned to his native New York. It was 1980, and Shabazz had taken up the practice of street photography as a means to connect with young men and women throughout the city. He used his lens to engage with strangers who caught his eye, speaking with them about the power of choosing the righteous path in life. After they finished their conversation, he would take their portrait to document this moment in time, creating an archive of work that taken the world by storm since Shabazz first began publishing his work in The Source magazine and exhibiting in Paris during the late 90s. The author of eight books including A Time Before Crack, Seconds of My Life (powerHouse Books, 2005 and 2007) and Sights in the City (Damiani, 2017), Shabazz is dedicated to depicting the complexities of contemporary life, capturing the triumphs and tragedies of everyday people trying to survive, and sharing stories rarely seen from the inside looking out. What Shabazz has witnessed and lived goes beyond what most people know both of his work and of life itself. Shabazz joined the New York Corrections Department at the tender age of 23 in 1983, working on Rikers Island, in the Manhattan Criminal Court building, and in mental health facilities. He served the full 20 years on the force with the understanding that he could best help his community working within the belly of the beast. 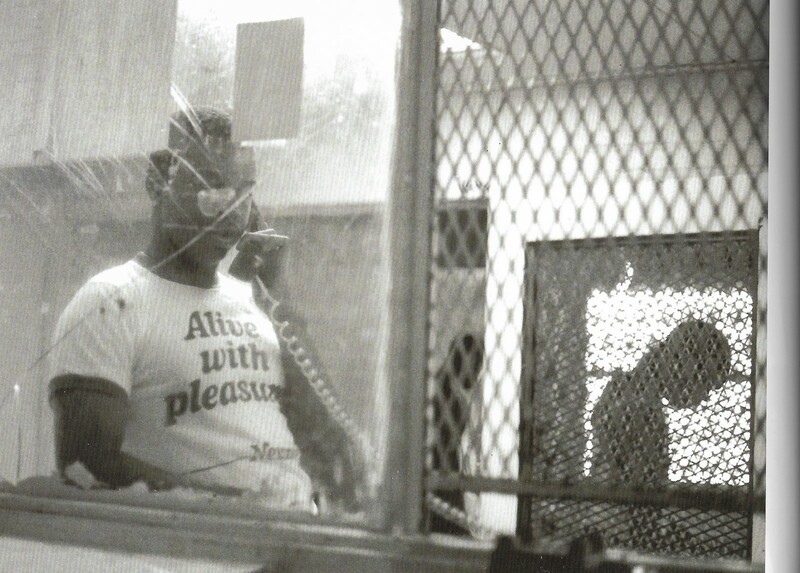 As a corrections officer, Shabazz bore witness to the devastating impact of the crack epidemic during the 1980s and 90s, when African-American and Latinx communities were disproportionately impacted by the vicious cycle of addiction, violence, and incarceration under the draconian Rockefeller Drug Laws which destroyed families and devastated a new generation coming-of-age. At the same time, he had to negotiate the reality for black men and women inside the penal system, where injustice and racism often went hand-in-hand. With the understanding that he was fulfilling a personal calling, Shabazz mentored countless inmates, always keeping the faith despite being in a volatile environment where injustice, violence, and trauma were a regular part of the job. Photography became a means for Shabazz to decompress and reconnect with himself, the people, and the environment – both within and outside of Rikers Island – and became a form of visual medicine to help heal the injured and protect the vulnerable from harm. Below, Shabazz, who was recently honoured with a 2018 Gordon Parks Foundation Award, speaks with us about his experiences as a New York Corrections Officer. Prior to joining the New York Department of Correction, what were your thoughts on the prison system? 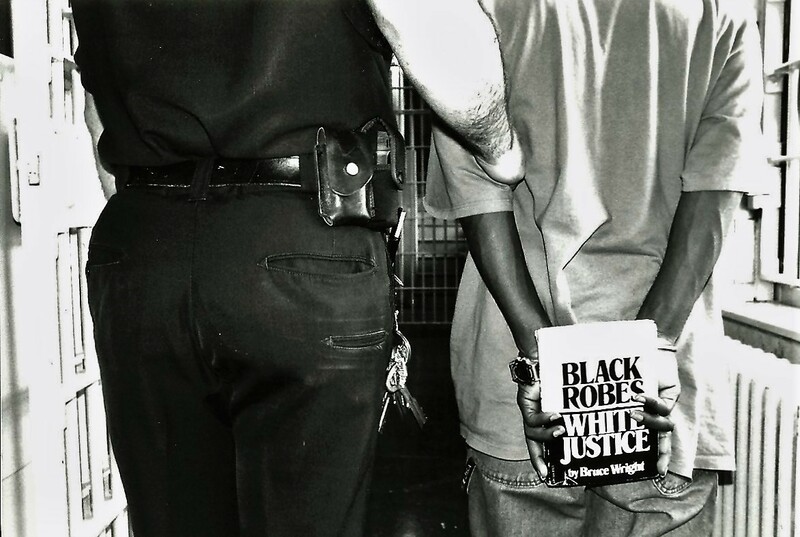 Jamel Shabazz: Early on in my life, I was aware that the criminal justice system was flawed. I had a firsthand knowledge of Rikers Island because a few of my neighbourhood friends were unjustly locked up there during the late 1970s for crimes they did not commit. Throughout their ordeals, I realised that a large number of innocent people were arrested and incarcerated unfairly. One longtime friend was locked up for over 25 years for a crime he did not commit and died a few months after he was finally released. Through my experiences and my studies, I became keenly aware that the criminal justice system had a long history of targeting people of colour and black men in particular. Racial profiling and unjustifiable police shootings continue to be widespread so I must always remain vigilant of my environment and the reality of being a black man in America. How did your training at the Correction Academy prepare you for what you were going to encounter daily on the job? Jamel Shabazz: At that time, the Correction Academy was situated on Rikers Island and the training was paramilitary. Trainees came from various backgrounds and consisted of a balance between blacks, whites, and Latinos – the majority being men of the ages 21 to 28. Our instructors were seasoned veterans who taught us everything from criminal law, penal law, weapons training, and physical fitness to first aid, mental health procedures, and suicide prevention. The training was helpful in so many ways; however, once you got assigned to a jail, no amount of training could ever fully prepare you for what you would face. Racism was real but covert in most cases. I was aware that there were racists on the job and I had heard stories from other officers who shared their experiences. It was no surprise to me as occupations of this nature are ideal for racists. There were tales of racist officers and supervisors rumoured to have tattoos of black children hanging from trees etched on their arms. On occasion, I would see racist graffiti in the common bathrooms. The facility to which I was assigned had a balanced staff of officers who, for the most part, looked out for one another. When the opportunity presented itself, we put aside any differences that we might have had and came together collectively. 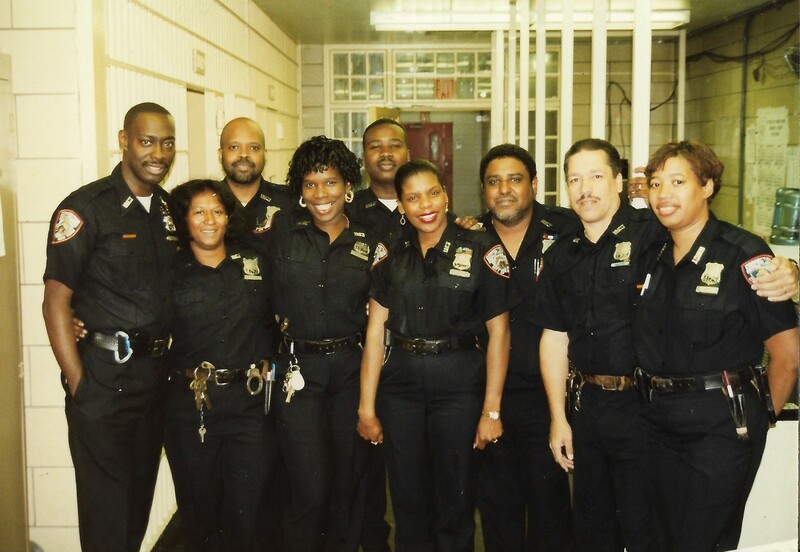 Could you give us a sense of what life was like for civilians living in New York City when you first joined the Department of Corrections in 1987? Jamel Shabazz: When crack first hit the streets, it was like a vicious tornado that devastated everything in its path. What many don’t know is that the crack epidemic seemed to be timed with the 1983 release of the classic film Scarface. The film was originally created to serve as an anti-drug message but that backfired and it became a template for many who would engage in setting up drug operations. During the early days of this crisis, the dealers would strategically give the drug away for free. They were well aware that the drug was highly addictive and euphoric. Once crack gained notoriety, drug crews were formed, the Uzi machine gun was introduced, already struggling communities became war zones, and the rate of violence soared. On any given day, innocent people just trying to go about their business could easily get caught in the crossfire of gun battles, which created both death and horrific injuries and children were not exempt. So many families were impacted. Many would fall apart due to their parent’s addictions: numerous children were placed in foster care, homes went into foreclosure, and the national war on drugs was declared. The drug users that were created as a result of this tragic time, particularly in black and brown communities, needed medical treatment but were given harsh prison sentences instead. As a newly appointed officer, I saw firsthand the destructive nature of crack. It seemed to take the soul and strip the dignity of its users. Women were greatly impacted by this drug and resorted to selling their bodies to support their addiction. These were very difficult days for me to witness. Could you speak about what it was like to be a rookie officer working in Corrections just as the crack epidemic began? Jamel Shabazz: When crack hit, the police department was given a green light to use whatever means necessary to combat this fast-moving crisis. Specialised units such as T.N.T. (Tactical Narcotics Teams) were established. There were also buy and bust operations, as well as major police dragnets catching both suspected dealers and users – and occasionally innocent people who were going about their business when an operation was in effect. The dynamics of the jails rapidly started to change; unlike the general population of inmates, those who fell victim to crack often came into the system broken; mentally and physically. On the street, there were crack wars between opposing crews over territory and once arrested, jail became the place to settle conflicts. Stabbings, slashings, and unforeseen violence impacted every jail, negatively affecting officers and inmates alike. How did the drug war impact prison conditions? Jamel Shabazz: As the crack epidemic escalated during the 1990s, the jail population skyrocketed thus requiring more correction officers on the job. The normal shift was eight hours but we would usually work 16s shifts on three out of our four working days. At the same time, racial tensions began to escalate. This gave birth to gangs like the Almighty Latin King Nation that ruled many of the facilities and then later the Bloods, giving power and dominance to a number of disenfranchised young men who felt powerless. It is also important to note that during the mid-1980s, a number of mental institutions were closed around the city and this once protected group now fell victim to the police sweeps. Struggling with mental illness, many patients were susceptible to crack and would get caught up in the system. It was recorded that over 30 per cent of the total jail population suffered from some form of mental illness but I always felt that the number was greater. Based on my conversations with officers who are presently on the job, it seems like the numbers have increased and are more like 90 per cent. What inspired you to begin mentoring the people? Jamel Shabazz: In becoming a correction officer, I knew that I was placed in a position to be a guide; however I never imagined that so many young men and women would need guidance. In witnessing this horrible cycle of self-destruction I could not stand idly by and felt I had no choice but to intervene and lend my voice to those who seemed to have some empathy and care. It was not an easy task. Officers were looked upon as the enemy and detainees as a rule stayed away from us unless they sought to manipulate you. Occasionally, I would find a young man or come into contact with someone from the neighbourhood that I may have known or even photographed. If the opportunity presented itself, I would engage him and strive to encourage him to educate himself while in this situation by going to the law library, reading books and publications of relevance, seeking atonement, and not falling victim to the system. Once I received my steady housing area assignment, I was able to develop a good relationship with a few individuals who I employed and mentored. I took an interest in one young man who had gravitated to me seeking knowledge and insight. Over time, he became a good worker and I would show him some of my photographs I had taken from the street. He was very receptive and sincere. He seemed to be a really decent person who had made a bad decision. Not long afterwards, another inmate shared with me that the worker I had taken under my wing was the main person responsible for shooting and killing a good friend of mine at a club. I also found out that he had a contract on his life and was sticking close to me because he was afraid. The news forced me to disassociate myself from him. It was to my regret because I never got a chance to ask him what happened and why he did it. He was convicted to 25 years to life. I later learned that he was murdered during the early stage of his sentence in retaliation for the murder he was alleged to have committed. I can still see his frightened face in my recurring dreams. One of the issues people outside the system have with the police is the blue line that protects the bad apples as it fosters a sense of “guilt by association”. Could you discuss the racism you faced as a black officer on the force? Jamel Shabazz: Let me start by saying that both police and correction officers are not exempt from misconduct and having a shield does not put you above the law. During the height of the crack epidemic, there was a lot of police misconduct; innocent people were knowingly arrested and there were constant reports of brutality from both NYPD and DOC. Some situations were rooted in hate; others were rooted in an “us vs. them” mentality. I always had to be on guard in civilian clothes because in the eyes of any police officer, black or white, I was a potential “perp” (perpetrator of a crime) regardless of just completing 16 hours on the job. I have felt the hateful gaze of law enforcement officers who have shown disdain for me purely based on the colour of my skin. My experience was not limited to white officers. On occasion, I experienced a couple of unwarranted incidents with police officers who were black women and were belligerent and hostile towards me. Besides those incidents, most of the hate I experienced was covert. There were never any direct attacks but I could sense the hatred by a couple of senior coworkers who were accustomed to upholding a slave master mentality of law and order and could not accept the fact that an officer such as myself exhibited dignity and concern. As an officer working in such a demeaning atmosphere, dealing with an endless stream of black and brown men who were, in my eyes, casualties of war, I refused to be one of them. Even though I knew that, just like them, I had a constant target on my back. How did making photographs become a form of visual medicine for both your colleagues on the force and the inmates while in jail as well as when you encountered them on the street? Jamel Shabazz: Prior to becoming an officer, I was already heavily devoted to the craft of image making and interacting with all sorts of people during my travels. When I got on the job, the opportunity provided me with an entirely new environment and population with whom to work. The work atmosphere was an extension of the streets. Many of my co-workers and the detainees were from some of the same neighbourhoods I was documenting, so the process of engagement was similar. What made the jail experience unique was that now I had plenty of time to get acquainted with those I sought to communicate with. I met a lot of correction officers, many who would go on to become close friends and mentors. Once the friendship was established, I would share my photographs, along with the significance of why I was taking them. In most cases, during that process, I would photograph them and pass on the print at no cost. Over time I would make portraits of hundreds of officers in a likeness to the portraits I made in the streets; the only difference was that that they were wearing uniforms. People have a tendency to forget that correction officers are human and have their share of problems as well. They may range from the hardships of working in such a violent and dangerous atmosphere to relationships, family issues, and drug addiction. Being an active photographer opened up a number of opportunities for me both on and off the job, as I was often asked to photograph weddings and social gatherings. The overwhelming amount of photographs I made were of officers and brass (people of a higher rank), and occasionally I would make portraits of a few detainees I knew from the street and who worked directly with me in a housing area. My relationship with some within the inmate population was more rooted in sharing my portfolios, stimulating them visually with photographs from what they called “The Free Cipher or The World”. My exchanges with staff and the detainees alike allowed me to use photography to find a common ground while documenting my journey. When not at work, I would occasionally run across many former inmates. In the majority of cases, they would want me to photograph them as free men. In revisiting my negatives from my time in corrections, I am amazed to see how my three worlds all came together, one frame at a time, and all serving as a larger narrative to who I am and what I have experienced over the years. I would like to conclude with the importance of these photographs today, in helping loved ones of people who are no longer here and finding out more about the people you photographed. Could you speak about the new life the photographs have? Jamel Shabazz: The various social media platforms have served as great conduits for me to share my work with the larger world. In the process of posting images, I learn so much about the subjects I have documented, from them directly or perhaps a loved one or a friend. Sadly, it has been brought to my attention via the comments that a few have passed away. Recently, I received a message from a young man informing me that he was the son of someone I photographed about 35 years ago. Looking at his profile, he was the spitting image of his father. The photograph he referenced was the same one I shared with the young man I was mentoring who had murdered his father. In this new chapter in my life, I seek to use my gift to bring some joy and awareness in a world so full of hate and discord. The language of photography along with the internet has enabled me to share my vision beyond anything I could have ever have imagined. I have greater clarity of purpose in life and an ever-growing global family with whom to share my vision and work.